I'm the Director of Developer Community at The Echo Nest, a research-focused music intelligence startup that provides music information services to developers and partners through a data mining and machine listening platform. 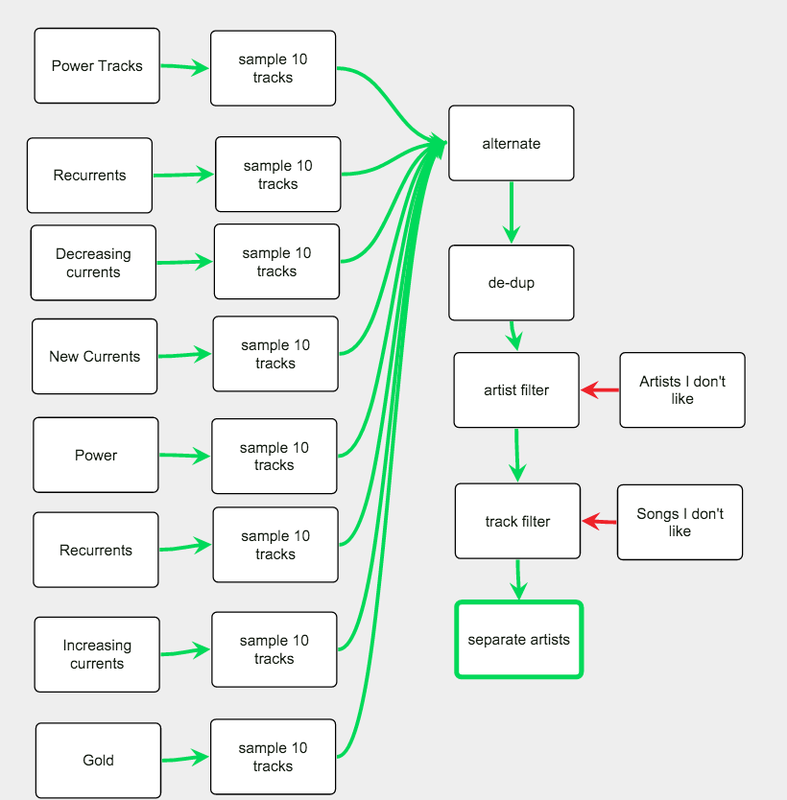 I am especially interested in hybrid music recommenders and using visualizations to aid music discovery. We are starting with a ‘gold’ track, and as Rob Gordon says You gotta kick off with a killer, to grab attention. That should be a power track. The bottom line here is that it was not really possible in Alpha V2 of Smarter Playlists to create a playlist that has a defined order of songs like we see in commercial radio and still apply the usual filtering. In Smarter Playlists Alpha V3 we fix that with one new component. So what do we do if we want to enforce a repeat song cycle, but still enforce a set of rules to ensure that we get a good playlist without repeating songs, artists and so on? We can use the newly added Mixer component! The Mixer is designed for this very situation. 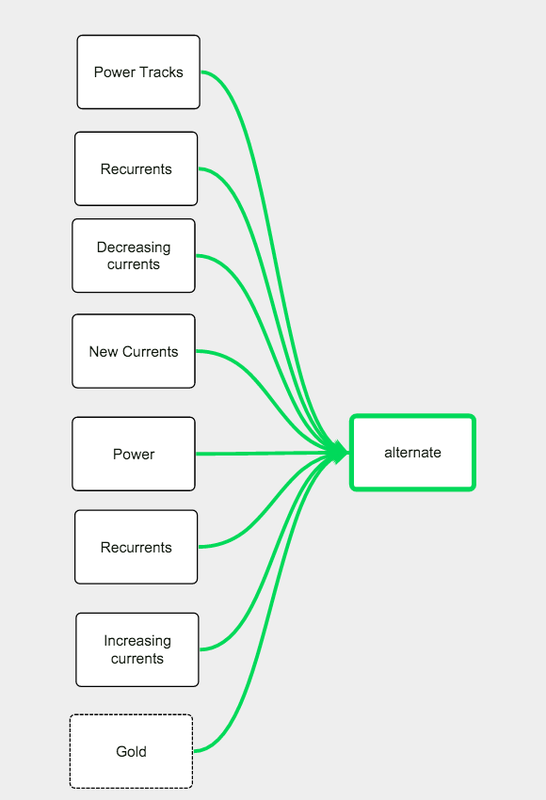 It is essentially an Alternator component but with all of the typical post-filtering built in, so you can generate a cycle of songs that respect all of the rules of a good playlist. 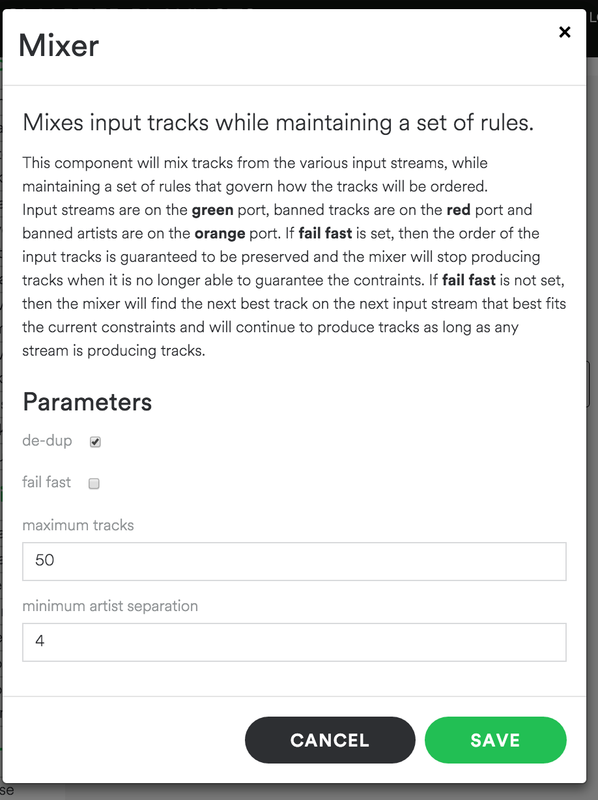 The Mixer component should make it easier to create broadcast-style playlists that follow a cycle, just like the pros do. Give it a try at Smarter Playlists. I’ve added a Date Filter component to Smarter Playlists. This component lets you filter tracks based upon the release date of the track’s album. Here’s an example program that uses the date filter to get all of the early Beatles tracks (those that were released before Revolver). Thanks for all the suggestions, for improvements. We are rapidly heading toward an official release. I liked the idea so I added a new Smarter Playlists component to make this happen. The component is called Save to New Playlist. Thanks Chris for the suggestion! 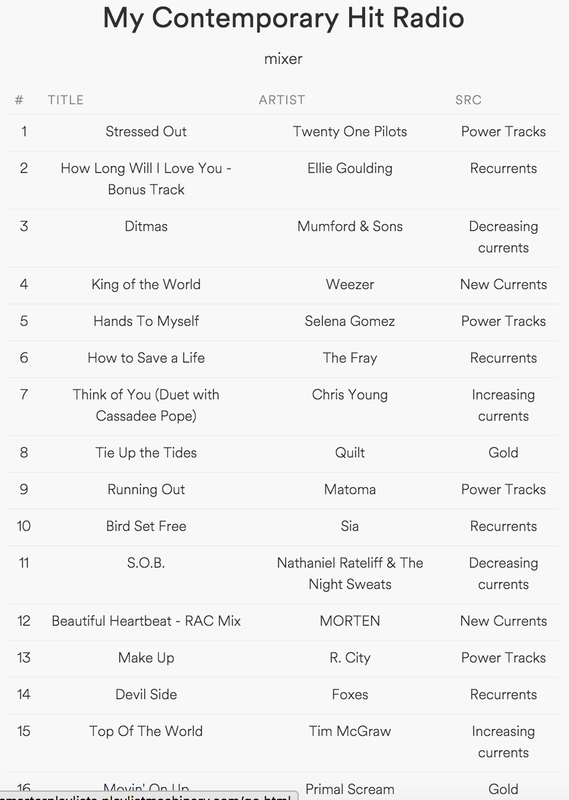 Earlier this week I released the second alpha version of Smarter Playlists. 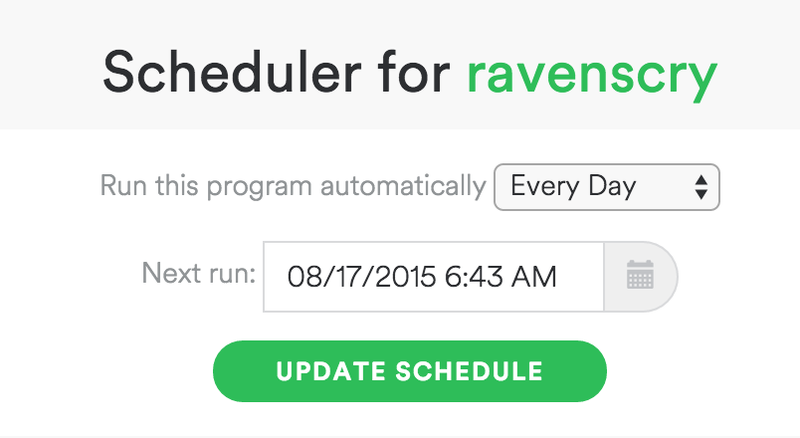 This version of Smarter Playlists includes a scheduler that will let you schedule your programs to run periodically. 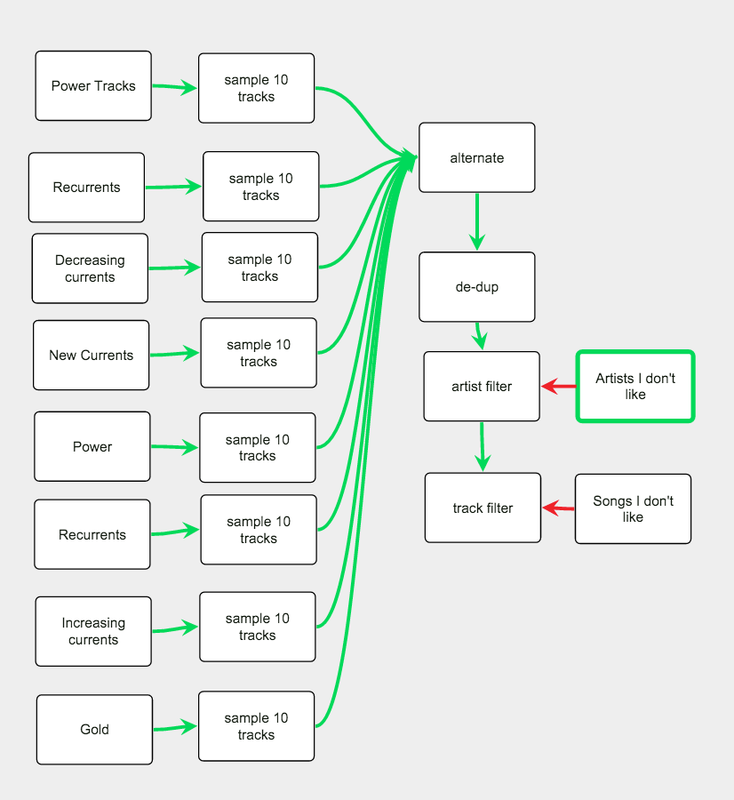 In this post, I walk through creating and scheduling a Smarter Playlist that will automatically archive your discover weekly tracks. Go to Smarter Playlists and login with your Spotify Credentials. Go to the Imports page and import the My Discover Weekly Archiver by clicking the Import button. 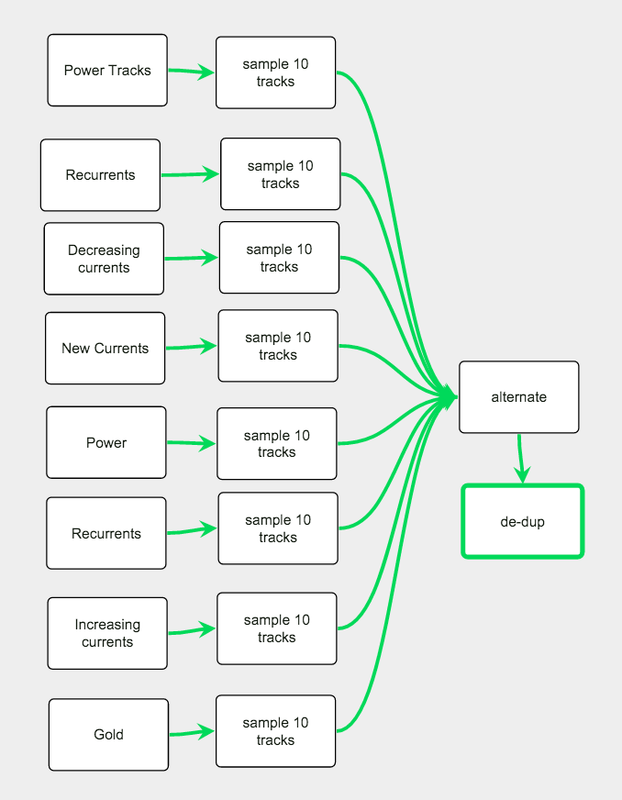 Ideally, you’d be able to just import the program and run it, but unfortunately, there’s no API (yet) that allows Smarter Playlists to find your Discover Weekly playlist, so you’ll have to customize the program with your own URIs. 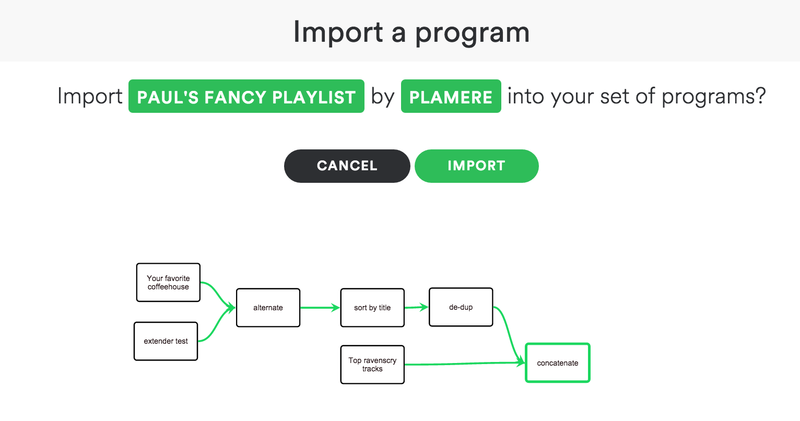 Go to the Smarter Playlists Programs page, find the program called “import of My Discovery Weekly Archiver” and edit it (by clicking the edit button). You have to add your own URIs to the program. First, in the Spotify Client, browse to your Discover Weekly Playlist (you can get to it by clicking on ‘browse’ and then ‘discover’). Right click on the playlist and Copy Spotify URI. Now in your Discover Weekly Archiver, double click on the box labeled ‘Discovery Weekly’. You’ll see the component editor page. In the URI field, paste the URI for your Discover Weekly. Go back to Spotify and create the playlist that will be your archive. Get its URI, head back to Smarter Playlists and add the URI to the My Discovery Weekly component, and the Save to Spotify component. Press the run button. If all goes well, you should see your Discovery Weekly Archive playlist populated with this week’s tracks. If you run it again, you should see the same tracks (since we filter out any dups). Step 6 – Schedule your program to run once a week. Once you are convinced that your program is running properly, you can schedule it to run once a week. To do this press the ‘schedule’ button next to your program to bring up the scheduler. Click on the ‘How Often’ drop-down and select Every Week. Set ‘How Many Times’ to an appropriate value (50 will back you up for a year). Click on Update Schedule to make it happen. If you want to schedule the program to run on a particular day of the week, click on the calendar button in the Next Run field to pick a particular date. Once you do this, your program will run once a week to archive your discoveries. You can check the status of your scheduled runs and see if there are any errors just be visiting the Scheduler page for your program. Going Deeper – how does the program work? Read on if you are interested in learning how the archiver works. The archiver is rather simple program. It consists of 4 components – 2 playlist components, a filter and a playlist saver. 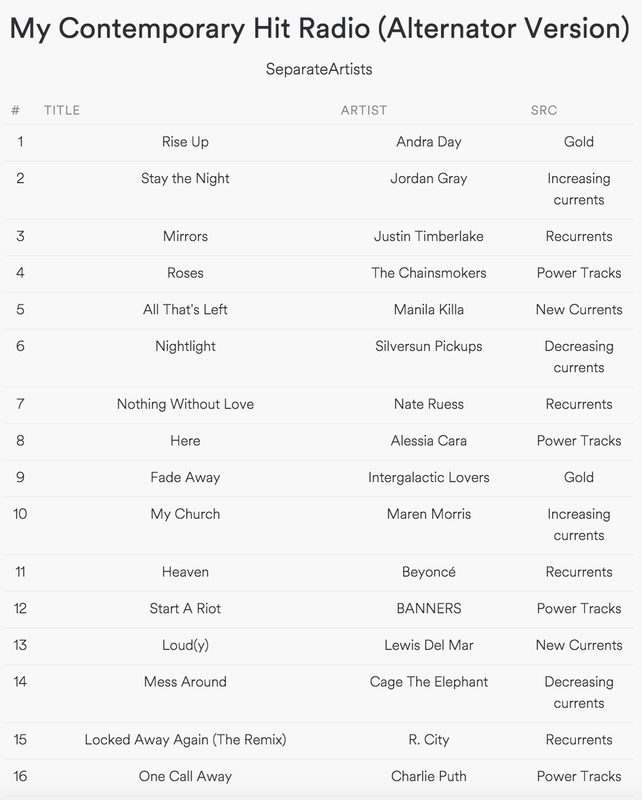 The first playlist component reads in the current Discovery Weekly playlist. The second playlist component reads the contents of your current archive. These two playlists are input into the track filter, this only passes tracks through that are on the green stream that are not on the red stream. The result is that only tracks that are not currently in the archive are passed through. 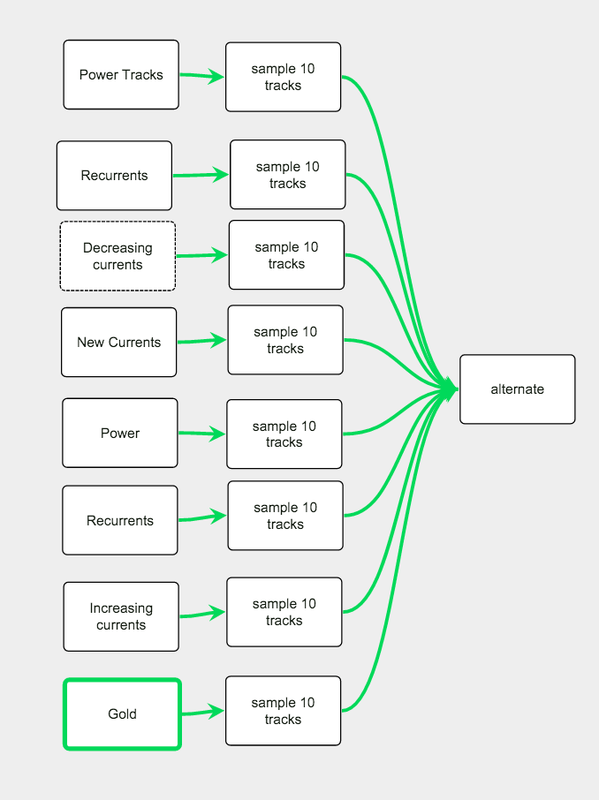 These tracks are then sent on to the save to Spotify component. This component will write the input tracks to the given playlist. This component has the append flag set so that it appends tracks to the archive instead of overwriting the archive. With all that URI copying I think it is still a bit too complex to set up a simple program like the discovery archiver. 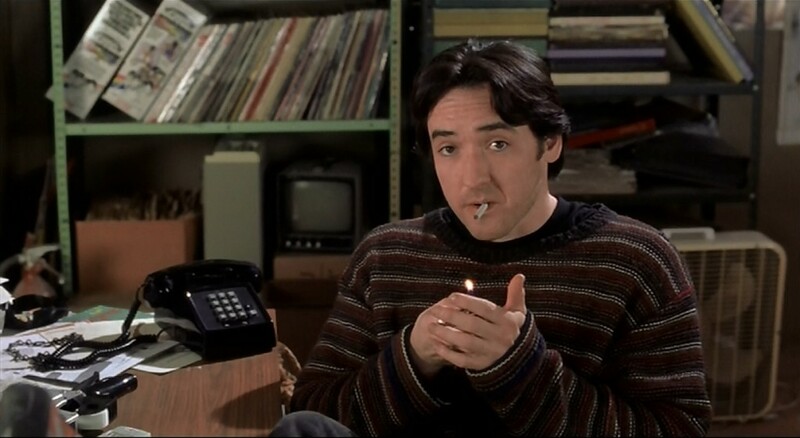 But as new APIs are added things should get simpler. Smarter Playlists Alpha V2 is here! Today, I’m releasing the second alpha release of Smarter Playlists – the web app that helps you automate the creation of sophisticated playlists. This big feature of this release is that you can now schedule your smarter playlist programs to run periodically. This lets you do all sorts of nifty things from automatically archiving your Discover Weekly recommendations to giving you a fresh mix of your favorites tracks with a few tracks from Fresh Finds sprinkled in. If you are a professional curator managing dozens or hundreds of playlists, you can use the scheduling feature to keep your playlists fresh automatically. The Scheduler lets you run your programs periodically. You can control how often your program runs, how many times it will run, and the exact date and time it will run. This release also gives you better ways to manage your set of programs. There are also a bunch of new components – such as personalized sources (my saved tracks, my saved albums, my followed artists, etc. ), a nifty artist separation component that reorders tracks to maximize the distance between tracks by the same artist and a whole bunch more. Note that the previous release is still online. Unfortunately there’s no automated way to move your programs from Alpha V1 to Alpha V2. This release has been nearly ready to go since August, but life intervened, and my time for spare time projects evaporated. Over the holiday break, I finally had some time to devote to getting this out the door. Give it a go and send me feedback.